So,my responsibility to decide this book's fate. Already hated by two readers, one more and it's into the Endsleigh Salon Room 101 Box. Taking the task very seriously I gave the book my undivided attention and am pleased to declare, Michael you are safe with me because I couldn't possibly hate this book. Yes, it's strange, haunting and perhaps completely odd but that made it an even better, far more memorable read.Always something that you can't quite touch, just out of reach.Writing that often stopped me in my tracks and made me re-read a sentence or two just to gather every last crumb. Undercurrents, almost intangible, of trains deporting Jews to concentration camps and the added mystery of the numbers recited by Bruno, the African Grey parrot and friend of the mute Jewish child Linus Steinman.Linus now living in rural England having escaped from Nazi Germany. Again, I was constantly reminded of the numbers tattooed onto the arms of the prisoners and I have no idea if I'm right or wrong in that interpretation and nor have I looked anything up about the meaning of this book. It has left me with an impression of its own that will suffice. When the parrot disappears it is the elderly local beekeeper,a retired policeman who decides to investigate the mystery. Lots of good beekeeping stuff which I always love as I am a failed apiarist (did the course, never got the hives) and there is the most heart-wrenching parrot's eye view of captivity at the end of the book that restored my faith in a bird which I don't like that much. 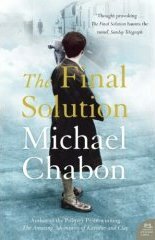 The Final Solution most certainly rescued and a book I will read again, as yet again it's one that has so much in it to miss first time round. And why don't I like parrots? More of that later today.